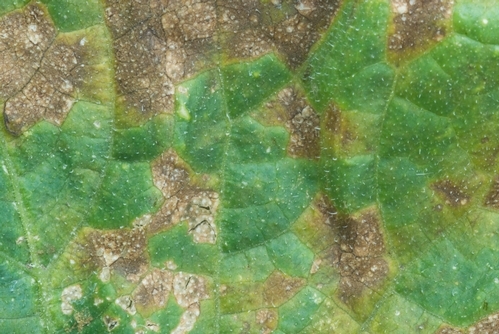 Downy mildew of lettuce, caused by Bremia lactucae, is the very common foliar disease that results in the familiar yellow to brown leaf lesions and accompanying white sporulation on the lesions. However, the systemic phase of lettuce downy mildew may be less familiar to growers and pest control advisors. 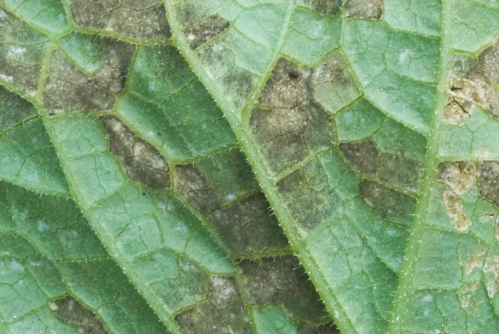 In the spring of 2009, systemic downy mildew was very common in coastal California. Currently in 2010, systemic downy mildew is not as serious but is still being observed in some coastal plantings. 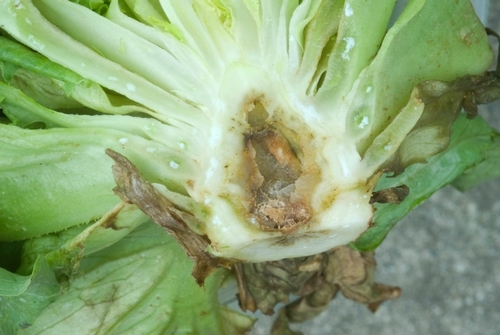 Symptoms of systemic downy mildew may be seen on both lettuce leaves and the central, internal core of the lettuce plant. For leaf symptoms, examine the plant for large, elongated regions of the leaf that are discolored and turning dark green to brown. Such regions often develop along the midrib of the leaf and extend into the flat, outer leaf panels (photos 1, 2). White sporulation is often not present on these infected areas until late in disease development. 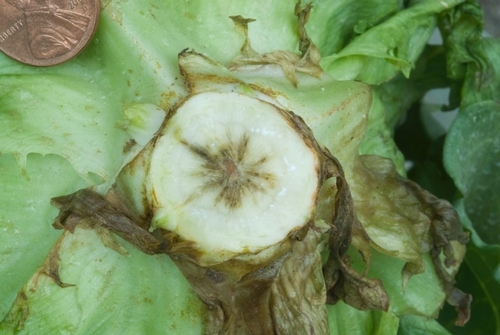 Note that for many systemically infected lettuce plants, these leaf symptoms are absent and the only evident symptoms are in the internal core. To check for systemic infections in the plant core, cut open and examine the central part of the plant; these tissues will show a dark brown to black streaking and discoloration (photos 3, 4). 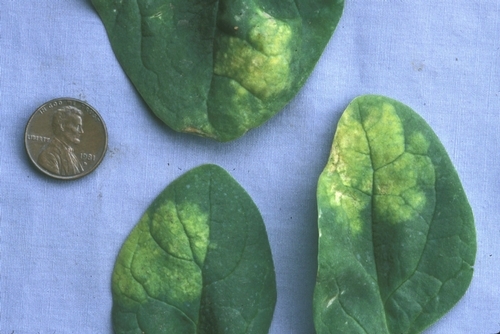 In some cases, systemically infected plants may be slightly stunted or late in maturing. Exercise caution, however, before concluding that internal core discoloration is due only to systemic downy mildew. Other important lettuce problems (Verticillium wilt, Fusarium wilt, ammonium toxicity) can cause similar internal discolorations. Confirmation of systemic downy mildew requires laboratory testing. Affected tissues can treated with biological stains and then examined using a microscope. Such procedures can show the presence of the characteristically thick mycelium that lacks cell cross walls (photo 5). In addition, incubating pieces of affected lettuce tissue can result in sporulation of the pathogen (photo 6, showing systemic downy mildew of cauliflower), again enabling confirmation of systemic downy mildew. 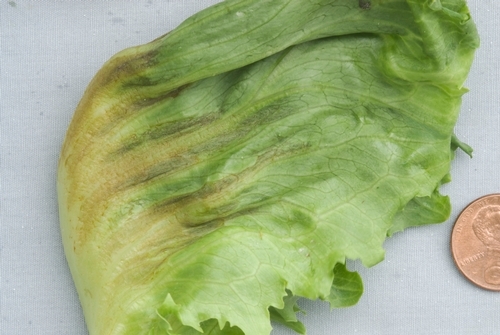 Systemic downy mildew of lettuce has not been studied extensively, so researchers do not know exactly what triggers this less common phase of the disease. 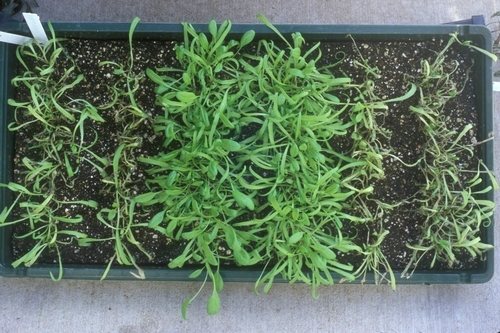 Some suggest that early infection of young plants may allow the pathogen to infect the inner foliage of lettuce, resulting in pathogen access to the plant growing point. Field personnel also report that some lettuce cultivars are more severely affected than others. 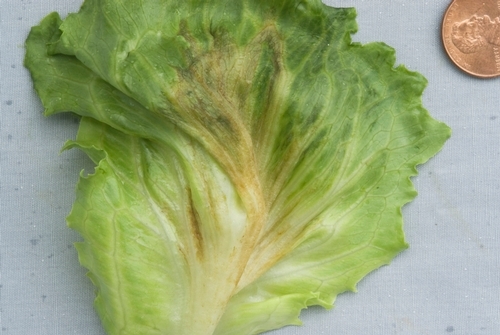 Photo 2: Brown discoloration due to systemic downy mildew infection in a lettuce leaf. Photo 4: Internal discoloration of lettuce core due to systemic downy mildew infection. 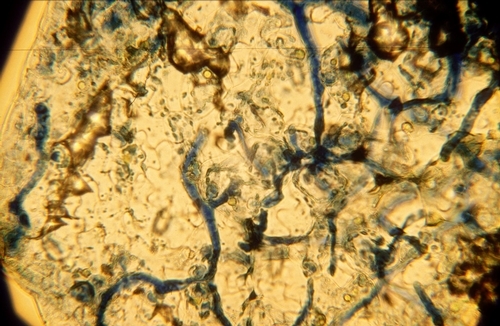 Photo 5: Blue-stained mycelium of downy mildew that has systemically infected lettuce tissues. 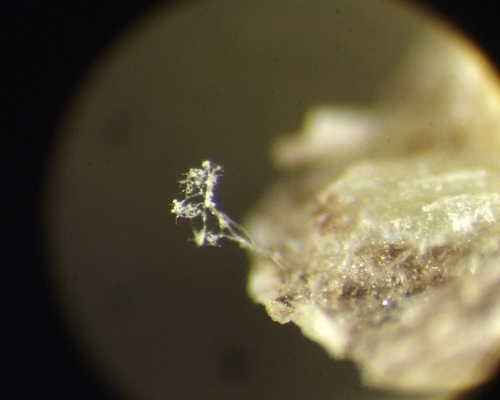 Photo 6: Sporulating downy mildew from a systemically infected piece of cauliflower stem.